Our Winter Lay Up and Spring Yacht Commissioning programmes ensure that your yacht is kept in safe ‘hibernation’ over the Winter months, and made ready in Spring for you to enjoy another season aboard. Please download our Yacht Lay-Up and Commissioning Order Form (PDF 50KB). 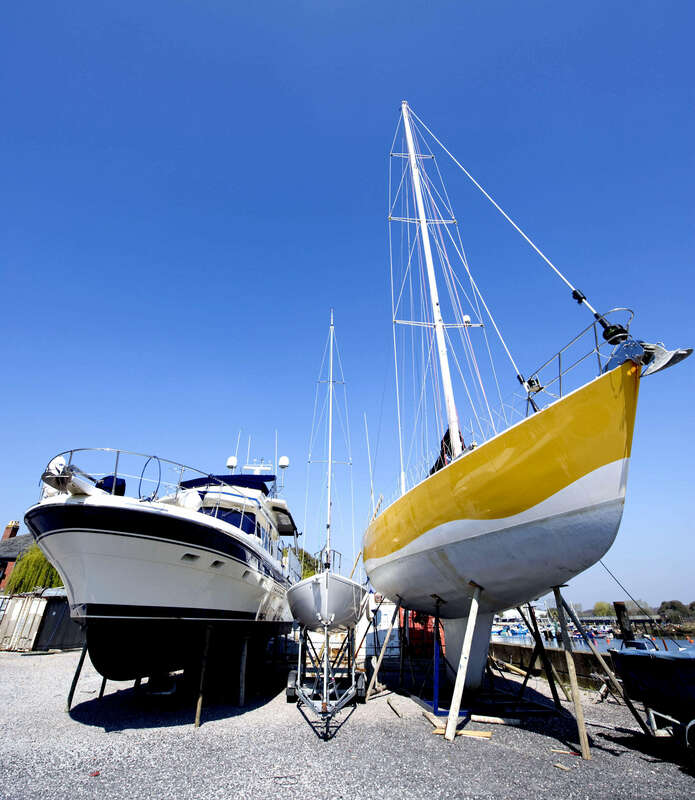 This contains a comprehensive list of all the routine items which should be attended to before laying up your yacht in Lymington, for the Winter, and to bring her out of hibernation the following Spring, ready for the new season’s sailing. Your yacht can be stored undercover or put on hard standing on Berthon Boatyard. See our Boatyard Prices page for charges. If you would like your yacht laying up at Berthon, please print out and complete this PDF form, and post or fax it to the address shown below the left menu. Alternatively, please contact us and one of our team will contact you as quickly as possible. Is your vessel protected from the diesel bug? Ensure you fill your diesel tank before Winter, and top up periodically any fuel burned by the heater or engine. The more empty space in the tank, the more condensation can form – diesel bug thrives on the oxygen in water. There are a number of fuel additives available which help to minimise the growth of fuel bug. Diesel is an organic fuel and there are over 100 types of microbial bacteria that can live in your diesel tank, feeding off the water and hydrocarbons that are present in fuel. By-products from the bug’s natural biological processes will contaminate fuel causing problems with the engine and lines. Berthon can help to clean your fuel and tanks if you suspect fuel bug is present. Personal Profile on one of Berthon’s longest serving shipwrights, Mike Prince. Berthon completes the layup and winterisation of many yachts each year, read about the art of a good de-commissioning.